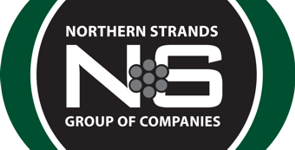 Welcome to The Northern Strand Group of Companies. Please click on our company logos to visit our full websites and receive more detailed information about our products and services. 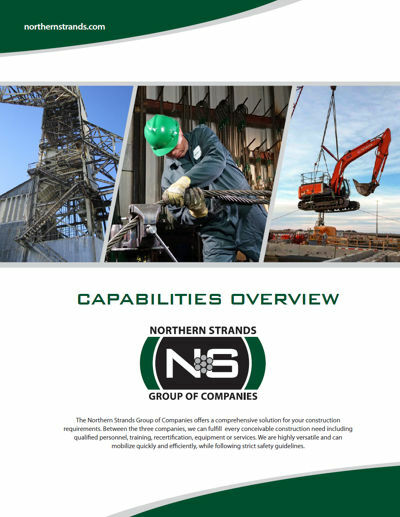 With health and safety in mind, Northern Strands has been supplying industry since 1970, evolving into five major divisions that offer needed tools and technical knowledge in mine hoisting and attachments, general rigging, engineered fall protection, suspended access and training. Thanks to the experience and expertise of our people, Northern Strands is able to deliver added value from the start of your project whether feasibility, upgrade or modification. The design and planning stages are where the greatest potential for profitability for our customers is found. Northern Strands Mining, Wire Rope, Attachments & Equipment Division excels by providing a wide range of equipment and services, by being the best full service provider of wire ropes, attachments, equipment and service. Truly Mine Hoisting Solutions®. Our Rigging Division is a full-service facility operating out of Saskatoon and Regina with the ability to fabricate custom chain and wire rope slings up to 1-1/2”. We have a vast inventory of synthetic lifting slings, chain hoists, lever hoists, shackles, trolleys, winches (tuggers), and other general rigging hardware. Our network of suppliers and in-house expertise is leveraged for the benefit of our customers. We have vertical and horizontal test bed services. Northern Strands provides compliance certified equipment with documentation. The Engineered Fall Protection Division offers a variety of fall protection systems, solutions and services. Custom-engineered solutions can be designed to suit specific requirements. Services and equipment include: Inspection and replacement services for overhead and vertical lifelines. Consulting, supply and installation services for single point anchors, guard rail systems, walkways and platforms and structural assessments. Northern Strands has a large and diverse Suspended Access Division. Our suspended access solutions have been used on sloped roof buildings, glazing applications, sheeting, insulation and concrete restoration, surface and underground in the mining sector along with many other uses throughout Saskatchewan and Western Canada. All of our equipment goes through a rigorous inspection and recertification process each time before it leaves our shop to ensure that our equipment will provide the most dependable solution for your needs. We provide onsite technical assistance with all suspended access rigging and setup ranging from simple to highly engineered set-ups. Northern Strands’ Training Division offers several courses that aim to increase the workplace safety and make you compliant with the latest Saskatchewan OH&S legislation. Our instructors have been trained by industry leaders such as Crosby, Miller, and Capital Safety to name a few. Flexible scheduling [is] available, including evenings, nights and weekends. Courses are recognized province wide, and designed to educate you on legislation from The Occupational Health & Safety Regulations, 1996. Training courses offered: Fall Arrest, Crosby Rigging, Tugger Safety, Confined Space, Wirelock Socketing and First Aid/CPR-C. Pertinent Northern Strands Certifications and Associations: COR Safety certified, Canadian Red Cross partner, ISNET, Mission Zero Charter Member, Canadian Dam Association Sustaining Member. Fortis mining, engineering and manufacturing provides services to the mining and construction industries. The company has a global focus that offers contracting, subcontracting and consulting services to a wide range of customers. Fortis is comprised of 6 divisions; Mining, Engineering, Manufacturing & Fabrication, Health & Safety, Equipment Testing & Recertification and Mechanical Services. Fortis has achieved and maintained ISO 45001 Quality Management. ISO 45001: 2018 Occupational Health & Safety, 14001 Environmental Management, OHSAS 18001 Health & Safety Management, Mission Zero Charter Member, Browz Member, ISNET and CWB. ISO benefits our customers by ensuring our products and services are safe, reliable and meet standards. ISO helps Fortis to continuously improve our processes which results in increased efficiencies that are passed along to our customers. We offer a wide range of services to the mining and construction industries; from exploration drilling, mine development, steel erection, piling, and concrete work to decommissioning. We perform site assessments and create safe work procedures to complete jobs, whether through a custom procedure, the design of a new piece of equipment or a combination of both. Fortis has access to the necessary engineering, manufacturing and testing facilities to complete this work in-house. We have the versatility to mobilize a single crew for multiple facets of work. Our strength and advantage rely on our ability to provide custom designs for our clients. Fortis manufacturing facilities offer machining and welding services as part of a complete fabrication process. In-house engineering and drafting enable us to design and develop custom solutions quickly and efficiently. We also own a recertification facility for testing a wide range of equipment and tools. Fortis has and always will be an industry leader in innovation. Whether it is a tangible piece of gear or a process or procedure, we engineer and manufacture with the goal of improving safety, efficiency and cost effectiveness. If there's a need for it, Fortis will design and build it. We use the products we build! Safety-focused, growth-oriented, providing turn-key services for Mining, Engineering and Manufacturing...Fortis does it all. We would welcome the opportunity to quote on your next project. Pertinent Fortis Certifications and Associations: ISO 9001 Quality Management, 14001 Environmental Management, OHSAS 18001 Health & Safety Management, Mission Zero Charter Member, Browz Member, ISNET and CWB. Certified Mining & Construction Sales & Rentals (CMC) is a Saskatoon based sales and rental company that offers specialized equipment to the mining and construction industries in North America. CMC rents to suit your company’s needs. Once rented, we will transport your piece of equipment to your job site within 24 hours. If ever a problem occurs with your equipment, we service what we sell and offer onsite after hours emergency customer support. 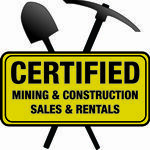 Certified Mining and Construction Sales and Rentals is a fully licensed equipment recertification facility. We specialize in the recertification of mining and construction tools and equipment. We can recertify and repair tuggers, chain hoists, lever hoists, 3M reloads, Kubotas and rough terrain vehicles. We will provide a test certificate for every piece of equipment we recertify. CMC has rented equipment to mine and construction sites across North America. Yet CMC continues to have strong ties to the local Potash mines in Saskatchewan. Much of CMC’s underground ready equipment can be found in mines such as PotashCorp, Mosaic and Agrium to name a few. Our partners have peace of mind knowing that CMC only carries the top equipment brands, ensuring high reliability along with CMC’s unparalleled service. Some of our top equipment brands include; Thern, 3M, Vitali, Atlas Copco, Genie, Multiquip and Wacker Neuson. As outline above, The Northern Strands Group of Companies offers a comprehensive solution for your construction requirements. Between the three companies, we can fulfill every conceivable construction need. Whether it be qualified personnel, training, recertification, equipment or services. We are highly versatile and can mobilize quickly and efficiently, while following strict safety guidelines. You will benefit from having a unified, cost efficient and coordinated effort on our part. The Northern Strands Group of Companies strives to show leadership in the mining and construction industries through quality workmanship, cutting-edge innovation and a commitment to health, safety environment and community. The Northern Strands Group of Companies is, "Three Companies, One Solution"
© 2019 The Northern Strands Group of Companies. All Rights Reserved. Proudly Canadian.